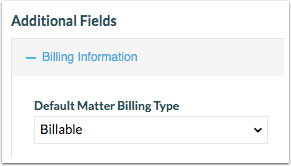 Rocket Matter Knowledge Base MattersWhat is default matter billing type? This is designed to set a default billing method on a per-matter basis. This is applied for all billable time entered for that matter. Billable: charges the client, shows on invoice. Non-Billable: doesn't charge client, doesn't show on invoice. No-Charge: doesn't charge client, shows on invoice. Prev: How to close a matter.